I’ve posted in the past about how my company, Stackify, makes some great tools that enhance the Windows Azure experience. By just using the Azure Management Portal, you don’t get a lot of insight into what is happening inside your instances, which are just Windows VMs. This morning, I noticed something quite scary, and fittingly enough, it’s Halloween. I deleted a deployment after doing a new deployment and VIP swap. But, after a few minutes, the instance still appeared in my Stackify dashboard. I thought this odd, as we monitor these operations and remove devices that have been deleted. Digging in showed that it wasn’t a problem with Stackify. This instance was still there, and still sending data. You’ll notice though that the “Status” check shows that the instance no longer exists. And it gets scarier. “Surely, this can’t be” I’m thinking at this point. 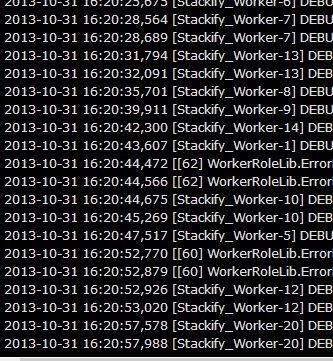 Knowing that this worker role is in our QA environment, it has debug logging turned on. 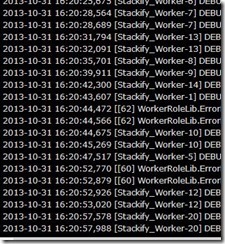 And, using our log file tailing feature, I can see that, yes, indeed, this deleted deployment is still executing code. Pulling messages off queues. Sending alerts. Changing data. Fortunately, our tools give me the ability to manually disable the Windows service that runs this code. In the meantime, I have contacted everyone I know (and support) at Microsoft to address this issue. Needless to say, this is concerning. When you delete a deployment, it needs to actually delete. Not continue to eat your data. As soon as I learn more, I’ll be posting an update.